American versus Englishman—will it be a war of wits, or a battle to find their hearts? 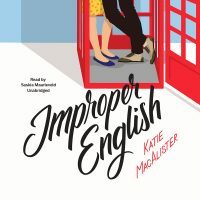 Alix hasn't had much luck in her life, but a trip to London, a matchmaking landlady, and the handsome Scotland Yard detective living above her indicate her luck is about to change. Has she truly found her perfect man, or will the disasters that dog her steps destroy everything she's hoped for? Alexandra Freemar should be in heaven—she's just been handed everything she's ever wanted on a silver plate: a three month stay in London, the time to write the book of her heart, and the chance to finally prove to her mother that she's not the miserable failure her past indicates. Alexander Black is a man with a mission, and no one is going to distract him from that, not even the uninhibited, carefree American who personifies everything he dislikes in a woman. But underneath that sassy mouth and devil-may-care exterior, he senses a wounded woman who's calling out to him, and try as he might, he just can't refuse answering. I had half a glass of Chardonnay left. I downed it in one gulp and held my glass out for more. I blushed at the look Bert was shooting my way and drained my glass hoping either I’d pass out from overindulgence of alcohol, or it would wipe my memory clean of my ungoverned mouth. “Sorry, I didn’t mean to be rude. It’s just that the wine reminded me of something…” I let the words trail away. It was bad enough, I would only make it worse. I grabbed a hunk of pita bread and dunked it into the tzatziki sauce. Bert laughed as Ray grunted in approval of my enthusiastic praise over the food. Tears welled up in my eyes at her kindness. Really, she was so sweet—both of them were. They had taken me into their home, listened to my story, fed me, tried to bolster up my spirits with wine and a friendly shoulder to cry on, and all I did was natter on about Alex’s balls, like they cared about them in the least. “No, no, I’d be happy to tell you what happened,” I sniffled, and grabbing the box of tissues and a bacon-wrapped shrimp, proceeded to tell them everything about my disastrous experience with Alex. There may have been some slight skewing of the basic events, but I was pretty sure I had covered all of the major points by the time we had killed two more bottles of wine, eaten all of the tzatziki, shrimp, and brie, and gone through countless tissues. I went through the tissues, that is—Bert and Ray seemed to be made of sterner stuff. By the time I finished my sorry tale, I was lying on the floor with my feet resting on the seat of a chair (Ray swore it would stop my “everlasting grizzling” and she was right. It’s impossible to grizzle for any length of time when you’re lying on the floor with your feet in a chair), Bert was curled up on the couch, and Ray was pacing in circles around us, making periodic grunts of outrage or agreement, as the situation warranted. I nodded and grabbed onto the chair when the room gave a slight twirl to the left. “Oh, that’s right, I knew that. Pants and pissed. Rumping pumps. Got it all up here.” I tapped at the side my head and gave Bert a knowing wink. She blinked owlishly back at me. “Maybe he’s gay,” suggested Bert with a polite little burp. I shook my head and had to clutch the arm of the chair to keep from sliding out of it when the room lurched again. “Not getting away with it,” Ray stormed, and marched over to the door, stopping only to take a long swig out of an empty wine bottle. She belched, waved for us to follow her, and stalked out the door. I looked at Bert. She looked back at me, sighed, and rose in one graceful motion. It took me three tries to get my feet under me properly, but at last I was mobile, and I made it up the two flights of stairs by clutching the back of Bert’s blouse and holding on for dear life. By the time we reached the top of the stairs, Ray was pounding on Alex’s door and bellowing for him to come out and face her like a man. Alex, standing at his door stark naked, his hair tousled, obviously just arisen from his bed, must have felt the weight of three pairs of eyes dwelling on his rampant nether bits, because he suddenly looked down at himself, swore, and slammed the door shut in Ray’s face. I released my hold on Bert’s blouse, slumped back against the wall, and let myself slide down to the floor. “Never mind,” Bert said at the same time Ray started pounding again on Alex’s door. She got two pounds in and was just delivering the third when he whipped the door open again. Even dragged out of what was probably a sound sleep, the man had quick reflexes. He grabbed Ray’s fist just before it hit his chest, and looked us all over. I was on the floor weeping softly to myself over the sad state of affairs, Ray was struggling to retrieve her hand, and Bert was swaying slightly and patting the top of my head while murmuring soft little platitudes. “Would one of you care to tell me just what the hell you think you’re doing?” he asked. I looked him up and down. “I liked you better without the bathrobe,” I said, sniffling. “Not till I’ve said a few things to you, Black,” Ray said, and pushed past him into his flat. Bert nodded and turned to ask Alex, but before she could, he muttered an imprecation about women placed on the earth to drive him mad, grabbed Bert and pushed her in to his flat, then marched out to loom over me in an intimidating manner. “Hi,” I said, trying for a minxish smile. He sighed again, then grabbed me under each armpit and hauled me up until I was standing. “Carry me!” I demanded, throwing my arms around his neck and letting my legs go boneless. He swore again, put an arm under my knees, hoisted me up, and hauled me in to his flat. Bert was rustling around in his kitchen, singing a little song to herself about tea, while Ray was pacing back and forth in front of his couch. Bert turned to look while Alex tried to set me down in the chair. I decided he was more comfortable, especially since I discovered I could slip a hand in through the opening of his bathrobe and stroke his chest. “Thank God there’s one sober member of this goon squad,” Alex grumbled as he tried to peel me off him without dropping me. “Alix, please,” he started to say, but stopped when Ray stomped over to him and poked a finger in the part of his chest that I wasn’t covering. “Ought to be ashamed of yourself!” Ray said, and poked him in the chest again. “Ashamed,” I agreed, nibbling gently along the outside of his ear. “It’s two in the morning,” he added, shaking his adorable head at me. “I’m not the one who answers my door starkers,” I pointed out. “Everyone rejects me,” I mumbled into his neck, dwelling on that fact. It suddenly seemed important, and very, very sad. Alex was my last hope, and now he, too wanted nothing to do with me. “Is there a horsewhip around here?” Ray asked, peering around with an avid look to her eye. “Maybe he’s not interested in her.” Bert curled up on the white couch after setting two more mugs of tea on the end table. I put one hand on Alex’s chin and turned his face until we were nose to nose again. A hot tingle in my eye region heralded the formation of more tears. “Too late.” Two fat tears rolled down my cheeks. Alex swore again, then turned around and carried me over to the door. Another tear tracked down my cheek as I grasped the doorknob and turned it. “What? What do you mean good night?” Ray asked, her head in one of his cupboards. “Thank you,” Alex said gruffly. Bert smiled and tugged a resistant Ray past him and through the door. “But I haven’t had my biscuit yet,” the latter said plaintively, still clutching her cup of tea. “I haven’t done anything to hurt her,” Alex protested. “Yes, you did,” I said softly to his neck, waving my fingers at Bert and Ray. Alex dropped my legs, but kept an arm around my waist as he closed the door behind us. I put two fingers across his lips. The lovely warm fuzzy feeling that had held me in its grip had started to evaporate, and it struck me that Alex had been sorely treated this evening. He kept his arm around my waist, allowing me to relax against him as he walked me down the stairs. I was conscious of a terrible sense of injustice regarding Alex, and wondered what I could do to make it up to him, to try and show him how sorry I was for annoying him. I fumbled with the lock, unable to see it through the tears. It struck me I was doing an awful lot of crying since I had come to England, but there didn’t seem to be much I could do about it. Maybe it was something in the water. “No, I won’t forget it.” The hands on my shoulders tightened and turned me around until I was facing him. One long finger wiped away my tears. “I’m sorry, I’m not usually such a watering pot.” It seemed like I was doing an awful lot of apologizing lately, too. “You changed my mind,” he corrected me, and breathed another kiss on my lips. I moaned softly and swayed into him, relishing the feeling of his strong arms sliding around behind me, pulling me closer to him, closer to the source of all the fires he built up within me. “Alex,” I murmured, and drank in his kiss. It was hot and sultry and held so much sweetness it almost brought me to my knees. I held myself still while he gazed at me with those unfathomable eyes, then sighed my relief when he wrapped one hand in my hair and held me while he ravaged my mouth with a kiss that not only took my breath away, but melted my knees and puddled my insides. When he released me I was panting for air, while he smiled a smug smile of complete male satisfaction. “Holy cow!” I gasped, clinging to the door to keep from collapsing from the effect of that kiss. His smile deepened in its smugness. I closed the door and slid to the floor, fanning myself and wondering what the hell I’d done.